As this year’s Sundance selection list came out, a friend from Calcutta pinged me on whatsapp, and asked why am i not going to Sundance. I asked why. He said two new films of Philip Seymour Hoffman are premiering this year. I told him i am sending my man to get the job done. I was serious about it, but it was too early to let the news out. A close friend and editorial team member of this blog, Neeraj Ghaywan, was selected to get the Mahindra Sundance Award. As our long chain mail between usual suspects went on and on about who wants what from Sundance – this bag, that merchandise, those liquor, that Quinoa, i said get me PSH. I never chase actors, they all are of the same breed, and mostly, boring. Have never bothered for anyone’s autograph or photograph – be it Hollywood or bollywood. It’s always the writers and directors whose tales attract me. But PSH was different. I reminded him again and again to get me his autograph on one of the posters of his new films. But if the film turned out to be bad? Well, it never mattered how the film was going to be. Because Hoffman was always great, in every bad film too. Neeraj reached Sundance. Updated us about what he has got and what he hasn’t. I reminded him again – Get me PSH! He said he can’t find him. I joked how it is possible to not spot such a fat man. He can’t hide anywhere. I don’t know why i was insisting so much on getting his autograph this time. Because there have been few occasions in the past where i could have managed it. Always wanted it, and always thought i will manage it some day. So never pushed the way i did this time. Now, it all makes sense. Maybe that thing call intuition. Few years back, as a friend updated me about how he came for the screening of their films at her film school in NY as he was executive producer on one of the shorts, i asked everything possible about him. As another friend saw one of his theatre act live, and narrated the experience, i would get gooseflesh imagining myself in place of him and thinking about his act in front of my eyes. Simply because he was one of my all time favourite actor. And one of the greatest actors of this generation. It was Magnolia when i sat up and took notice of Hoffman’s talent for the first time. And then went back tracking him in all those small roles. The fat guy in supporting roles with hardly any screen time but making an impression in every role he portrayed – from Scent Of A Woman to Boogie Night, Hard Eight to Happiness. A drag act in Flawless to a suspicious act in The Talenetd Mr. Ripley. As he started getting noticed, meatier roles came his way, screen time increased, and so did his weight. And i always found that it worked in his favour. An actor so fat, it always made him look like he was one of us – not fit, never in perfect shape. Few actors are so fat. And among those, most just use their body as a prop for comedy. That’s the general routine. Fat actors in serious roles are a rare breed (Yes, Gandolfini too). A character actor who gradually when on to become the leading man with all his weight intact, he became my favourite fatso. In any conversation whenever we would talk about films and acting, i would call PSH exactly that – favourite fatso. It made me feel as if it was all cool and casual between us, as if i knew him well, and could joke about his weight like we do with close friends. So when he portrayed any character, it just added a natural layer to it. He always looked like that distant uncle whom you are fond of, one who would give you a bear hug on a bad day, share a beer with you after yet another heart break, and will tell you stories about love, life and experiences of yesteryear. He made it difficult to believe that he wasn’t the real Dan Mahowny, or the real Truman Capote. And then came one of my favourite films starring Hoffman – The Savages. I saw my reflection in the role he portrayed, that bittersweet sibling equation, and it made me face my own fears. “Excuse me, we haven’t served refreshments yet” bit still brings a smile on my face. Watch this gem if you haven’t. When the news came out of his collaboration with one of my favourite screenwriter, Charlie Kaufman, i tracked every possible news about it. The expectations were too high. The film left me bit cold with all its complexities, but i could not imagine any other actor who could pull that off with so much ease. He was the Caden Cotard who taught me what “Cotard’s Syndrome” is. He held his own in front of Meryl Streep in Doubt, he made fat look cool in The Boat That Rocked. If i start counting all his films, the list is long – Charlie Wilson’s War, Moneyball, The Ides Of March, and one of the most powerful roles in recent times – The Master. The hypnosis he could do on screen always felt real. Has he ever done a film where you don’t remember him? Naah, i don’t recall. As far as the autograph story goes, now it feels like Mary and Max story – an animation film which he voiced. There were no letters between us, i guess his films were enough. And like Mary, i also got bit late. Do watch this gem too if you haven’t. 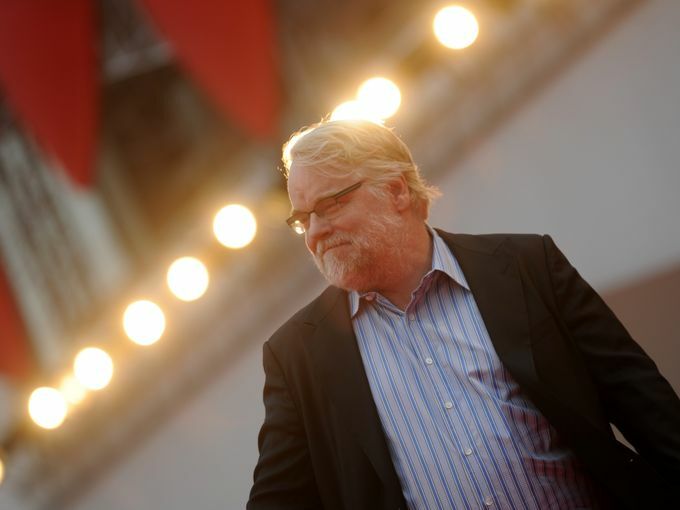 Thanks for all the movies and the memories, PSH. I don’t understand actors. You were the one whom i really loved, respected, and was in total awe. It’s been 24 hours now, and it’s still difficult to believe that there won’t be any new film starring The Philip Seymour Hoffman. I still feel the news is still not real..Felt such a deep,inexplicable connection with him..He made me feel normal through his characters in some way..His line abt Loyalty in Ides of march affected me deeply..Don’t remember him ever saying any dialogue which felt unconvincing..But wanted to remember a different Psh so watched The boat that rocked again today which i love..Will always remember his mumble as he jumps from the top of the boat right in the ocean, refusing to be the chicken..
And Pirate radio and its last scene . Another one of PSH’s gems . Now it seems like he was paying tribute to himself.